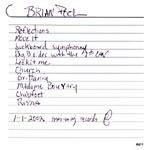 This CD-R contains some of Brian Pool's compositional work, played on guitar against drum machine with occasional accompaniment on keys. His writing has matured quite a bit since leaving the big city. Now, if he can just find some mates to build a band around, this material will be awesome. One roots rockin' vocal titled "Lookit Me" is also here. Long echoed guitar notes yield up a slightly moody melody with a haunting fifties sound. Bluesy and a little moody, the rhythm's bounce against the guitar create a kinda open plains escape from a troubled life. Cheesy keys and a circular bass line support a bluesy guitar not unlike the break in the Groundhogs' "3744 James Road." "Move It" is an interesting bit of writing. A trotting pace and a light ambiance develop under long echoed guitar lines. This is a very scenic piece, with some really nice writing and developmental possibilities. A bit of a spaghetti feel, big echoed guitar, and strong attack combine to create a dissonant Italian western feel. Dramatic and dangerous. "Church" is a bit of a churchy thing in a sixties doom and gloom vein. The guitar melody and keys offset one another well, and the structure is very workable. Again, there's a sense of the Groundhogs about it, but with double picked lines and a Midwest feel. I think the sub disco beat here creates an interesting contrast against the sub cowboy guitar lines and thick sound. Very pretty melody, though cautiously sad. Nice writing. This semi dirge features an interesting use of soft double picking and churchy tone. It's much like a scene at some lost Boot Hill. Quite intriguing. Kinda bouncy in a chumpy sorta way, this grinning line dancer is tweaky and a little silly, but not cutesy or contrived. Quite fun. With an interesting rhythm, "Russia" displays a scene of a cold Cossack life resigned to the way things are. Moody and almost dismal, yet with a fine melody line and some great developmental possibilities in a band setting. The dark surfisms of double pick gloom are very cool!